Trapped on a dying world, the Doctor and Charley come face-to-face with those responsible for the war to end wars, while C’rizz tries to understand what has happened and learns the terrible truth. Powerful forces are at work on Bortresoye that not even a nuclear holocaust can tame; natural forces that have excited the interest of Excelsior, the self-proclaimed saviour of her people. With Charley immobilised and C’rizz left to battle against the elements with some of the victims of war, one final, desperate hope of escape presents itself to the travellers. But who will be the last to leave the planet? Who will have to stay behind? And will the Doctor, Charley and C’rizz live long enough to find out? 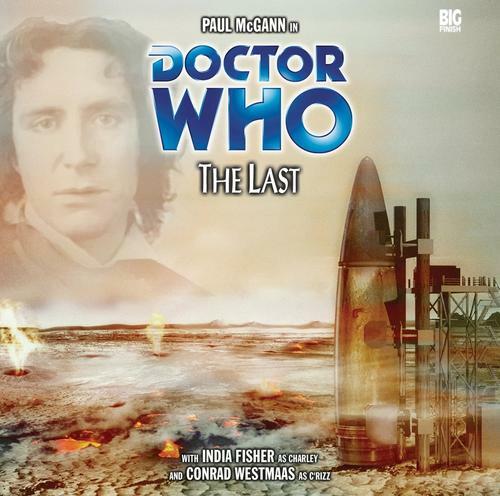 Paul McGann is the Doctor in The Last. Star Trek: Voyager. Reset button. Most science fiction fans immediately remember the correlation between the two. Star Trek: Voyager was a series on the American network UPN from 1995 to 2001. A Federation starship, USS Voyager, was transported to the far side of the known universe, and then some, by a mysterious being. Forced to ally with a group of terrorist and insurgents, Voyager travelled through the unknown and unmapped Delta Quadrant, encountering strange beings and unknown alien races as they tried to make their way back home. It was a great concept, and one that had the potential to make for some great television. Sadly, the number of “great” or even “good” Star Trek: Voyager episodes could be counted on two hands, and that’s being generous. The show played it incredibly safe through its run, downplaying tensions between the Federation personnel and Maquis terrorists. While new villains and alien species were introduced, the show’s main villains ended up being the Borg, who showed up time and time again in the classic case of “going to the well one too many times.” Most disappointing of all, the writers had a tendency to push the “reset button” at the end of each episode. The crew would experiencing something that caused a massive physical change, or run short of critical supplies, or even go through some horrible emotional or mental experience. But by the end of the episode, everything would be back to normal. The characters would act no different and the events of the episodes were rarely mentioned again. This was no more prevalent than the two-part episode Year of Hell, which showed the Voyager slowly being beaten and worn out, its crew being killed by constant attacks by an alien race and the very ship itself being cannibalized for parts. It was very good television and one of the best two-parters Star Trek ever did. But it was all ruined by the climax, where thanks to the actions of two Starfleet officers, everything that happened over the past “year” was wiped away, with not a SINGLE member of the crew remembering anything that happened and the point-of-divergence for the whole “Year of Hell” being handwaved away with one or two lines of dialogue. What could have been an episode with long-term ramifications, with the memories of everything haunting the crew, was wiped away with a few simple temporal mechanics . It’s perhaps the biggest “reset button” offender of the show’s entire run. When The Last was released in October 2004, this was the big cry from the Big Finish faithful. Even to this day, many people deride this episode as “the serial with the major reset button.” While, as one could probably tell by the fact that I opened up this review with a Star Trek: Voyager reference, The Last does contain a hitting of the reset button, it’s actually done so in a way that reveals to the Doctor a BIG piece of the puzzle that is the Divergent Universe. The story itself is very strong, an anti-war screed that doesn’t pull any punches, and there are several scenes that catch the listener completely off-guard. The play’s success is almost held back, however, by some slightly off-kilter performances from two of the regular players. The war is over on Bortresoye, and Excelsior stands triumphant with her victorious people. At least, that’s what the Ministers tell her. Safely hidden below the surface in a secure bunker, her two surviving advisors Trafinial and Voss do their best to hide the truth from her; the war has turned the entire planet in a nuclear wasteland. The Doctor, Charley, and C’rizz experience this first hand as they arrive in a dead city from the Interzone. Soon separated by a collapsing building, C’rizz finds a group of survivors in the ruins, while the Doctor and Charley, trapped under a beam, are rescued and brought into the bunker at the behest of Landscar, the third and most trusted of Excelsior’s surviving advisors. During their rescue, however, Charley and the Doctor realize an awful truth; the beam has crushed her spine from the neck down, and she will never walk again. As the Doctor swears to find a way to cure her, C’rizz leads the survivors to the bunker. Around them, the planet enters its death throes, ravaged beyond repair by the actions of its inhabitants. The means to escape the planet are present, but who will survive, and who will be left behind? The Last was the last of four audio plays I listened to on a round-trip from Washington, DC to Orlando, Florida. It’s the one that stuck with me the most out of the four, made a bit more relevant by the fact that I was driving through North Carolina and Virginia during the play’s runtime; two American states that are very pro-military, to the extent that North Carolina proudly proclaims it on its “Welcome to North Carolina” signs. With the exception of Robert Shearman and Scherzo and the finale of the Divergent Universe arc, The Next Life, all of the Divergent Universe stories have been written by first-time Big Finish writers. Gary Hopkins is no exception. The Last is the first of several audios Hopkins will pen, and it’s the first to fully embrace the Divergent Universe since the arc’s opening story. While Faith Stealer plays with the concept a little bit, The Last dives right in with a story that could ONLY take place in the Divergent Universe. Hopkins gives us an anti-war screed that borders just a little bit on preachy, but not enough to annoy the listener. He pulls no punches with the descriptions of the blasted wasteland or the tough choices the survivors must be willing to make. The final moments of the third episode in particular were an absolute gut punch, done in a way that made no mistake about what actually happened. It was both brutal and brilliant at the same time. If one were to look just at the script alone, The Last would be one of the best episode of Big Finish’s run, up there with pieces such as Creatures of Beauty or A Death in the Family. Sadly, the script doesn’t exist in a vacuum. For some reason, Paul McGann seems just a bit off with his performance in this story. McGann will grab hold of a solid script and refuse to let it go, as seen with The Chimes of Midnight or The Natural History of Fear. Here, we have a Doctor who has been beaten, battered, bruised (physically, mentally, emotionally) and is now stranded on a dying planet with little hope of escape and his companions injured or missing. If one were to go by dialogue along, Hopkins seems to have the best “grip” on the Doctor during his time in the Divergent Universe; weary, at the end of his rope, but with anger and frustration just under the surface, pushed on and on by his urge to never, ever give up. For some of The Last’s run time, McGann shows that smoldering fire, but at other times, where he should have cut loose and let that rage and sense of futility boil forth, he was just incredibly bland with his delivery. I don’t know if McGann was tired or just having an off-day when they recorded this story, because when he quietly tells Charley how sorry he is at the dramatically appropriate moment, it doesn’t come off as dramatic appropriate. The same comes when he claims that he could kill Excelsior, something the Doctor rarely says. McGann just sounds utterly bored by the whole mess; not desperate, not a Time Lord who’s finally run out of “give a damn,” but an actor who just wants the session over with. One could make the case that the nature of Bortresoye is the reason for the Doctor acting how he does, but it’s a weak reason. The Last sees McGann turn in a good performance, but after hearing the story, I was bummed that it wasn’t the great one it could have been. I joked that Faith Stealer saw Charley with very little to do. In The Last, she spends a good portion of the serial lying down! Injured in the opening act, Charley is paralyzed from the neck down for the rest of the story’s runtime. One would think that the Edwardian Adventuress would be upset, spitting nails and vowing that she’ll do whatever it takes to get back on her feet. Instead, what we get is a Charley who…gives up. The woman who stowed away on the R-101, who threatened to slit her wrists to free the Doctor from Edward Grove, the woman who stared down Zagreus and flung herself into the Divergent Universe because the Doctor shouldn’t be alone…gives up. She tells the Doctor “it’s alright, I’ve accepted it.” Acceptance of her condition happens way too fast. Charley shouldn’t be bubbly and happy five minutes after finding out she’s paralyzed for the rest of her life. This is the major misstep in Hopkins’ script and something that director Gary Russell and India Fisher should have ironed out with him before production. This is the moment that made me realize that, at least with audios, it should be the Doctor and one companion over the long-term. Charley has been given the back seat during most of the Divergent Universe arc and her character progression has suffered as a result. Now, I say this while knowing that the Seven/Dorothy/Hex trio will be incredibly awesome, but with Eight, Charley and C’rizz just haven’t been written properly enough for them to gel and come off as a functional TARDIS crew. It’s funny that I say that, because Conrad Westmaas is great in The Last. C’rizz gets the chance to emote like crazy, wondering if he’s going insane because of the group of survivors he found and the fact that no one else can see them! When push comes to shove at the end, it’s C’rizz who stands up for Charley (no pun intended this time), and his verbal sparring and rage against Excelsior are among the best moments C’rizz has put thus far. C’rizz still isn’t quite growing on me and I’m really wanting things to go back to the Doctor and Charley, but I will give credit to Conrad Westmaas for doing the heavy lifting out of the three in this story. And the truth of the survivor’s leader Requiem, and the fact that only C’rizz can see him, sets up events for the arc’s finale, The Next Life. It’s a great supporting cast, one of the best that Big Finish managed to put together up to that point. What makes it more impressive is that, aside from Ian Brooker, the other cast members only have a handful of Big Finish appearances between then! Brooker has appeared in several audios including Embrace the Darkness and The Time of the Daleks, while his counterpart, Robert Hines, makes his only appearance with Big Finish in this story. Both of them play the part of political advisors seeking to save their own necks very well, only giving the right amount of correct information to Excelsior and “lying by omission” to save their necks, squabbling for those little pieces of power in a world already gone to hell. Requiem, the ghost of a planetary archivist with an anvil-esque name, is played by Tom Eastwood in his only Big Finish appearance. He does a fine job interacting with C’rizz, a plot point that becomes very important during The Next Life, as the tortured leader of the planet’s ghost. Speaking of the planet, with another conspicuous name like Landscar, it’s no surprise that Richard Derrington, bucking the trend by starring in a previous Big Finish production before this one (The Harvest), is Bortresoye’s avatar, representing a world ruined by humans and ushering it towards its final end via whispered advice to its leader. And indeed, it’s another Big Finish newcomer, Carolyn Jones, who absolutely crushes it as Excelsior, the deranged, delusion, and psychotic leader of Bortresoye’s blasted remains. Part the regality of Queen Victoria, part the iron will of Margaret Thatcher, and part the insanity of Queen Elizabeth from Blackadder II, Jones plays the unhinged leader who lives in her own reality and will kill anyone to maintain that illusion. Strong in voice and speech and firm in conviction, Excelsior is one of the best female antagonists across the entire Doctor Whocontinuity. She’s the best type of villain; the kind who believes completely and utterly that every action they take is justified. Excelsior spends a good bit of time primping her make-up and worrying about the delivery of her grand victory speech to her (non-existent) subjects. But when she shows her dark side, it packs a major wallop. 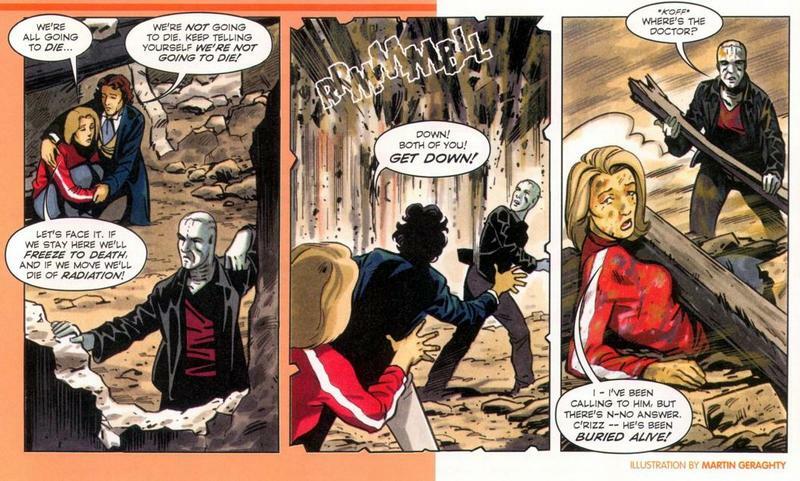 Her casual threats towards her surviving advisors, her dismissal of the deaths of other survivors in the bunker; Jones’ delivery puts them a cut above most other Big Finish villains. But it’s her big moment in episode three, when it’s just her and Charley, that is absolutely chilling and played perfectly, utterly, ruthlessly straight. Jones would go on to appear in the I, Davros range, but maybe it’s for the best that this is her only main range appearance. It would be nearly impossible for Jones to be any better than she is in The Last. I’ve read a lot of post-apocalyptic fiction in my time (I highly recommend Robert McCammon’s novel Swan Song as a great example of this genre) and David Darlington’s sound work here is the “soundtrack” I always imagined and now never want to hear again. He hits the right notes with both the ruins of the city and the claustrophobic bunker. We have whipping winds, collapsing buildings, boots crunching over rubble, all done in an incredibly unnerving and disturbing manner. Then we have the echoes of the stone tomb the survivors inhabit, along with the sounds of water breaking in and the desperate flight from the flood. The music is a few dramatic stings, but the sound work is what truly stands out in this story. I opened this review talking about the “reset button.” The Last has been criticized for wasting a golden opportunity. It’s like Hopkins looked at the end of Warriors of the Deep and thought it was too optimistic, that “kill them all” was a challenge and not a guideline. But at the very end, things are back to…quasi-normal, but with major changes. That’s where I think people who complain about the “reset button” are missing the point of the story. The events of the story and the memories of all involved, save the Doctor’s, are wiped away, but in a manner that makes perfect sense. Finally, after audios and audios dancing around the topic, listeners finally get to know what’s so important about the Divergent Universe; everything repeats itself. Events, lives, people, places, they all happen again and again and again. Each time, little things are changed, but the end result is almost always the same. In this case, Bortresoye would always be depleted, nuked, and destroyed, no matter how many times the pattern was reset and the population allowed to try again without knowing of their previous mistakes. It wasn’t until the Doctor showed up that things truly and completely changed. This realization made me go back to consider my review of The Natural History of Fear. I said the Doctor’s presence didn’t matter, and I was wrong. His presence has mattered. And it’s no wonder that the three best stories in the Divergent Universe arc – Scherzo, The Natural History of Fear, The Last – all focus on this topic. The nature of the Interzone is explained, just what these “experiments” are supposed to be is laid out for the viewer to draw their conclusions, and the Doctor, finally armed with the proper knowledge, is ready to move on and confront the Kro’ka once and for all. It’s not hitting the “reset button.” It’s entering “THE DOCTOR” as a cheat code. Faith Stealer was the story that the season needed to open with; funny, a bit light-hearted, and brushing alongside different ideas and concepts. A complete 180 degrees from that story, The Last finally moves the Divergent Universe arc forward in a large manner. Events are set in motion, but with only two stories to go, things are beginning to feel a little rushed as Big Finish finds itself pressed for time. If the entirety of the Divergent Universe arc was up to the quality of this story and did just as fine a job of both touching about what make this reality so different and pushing the metaplot along, then I would be a bit bummed about the storyline only getting two seasons instead of three. As it stands, subpar performances from McGann and Fisher aside, The Last is a great story that I would rank below only Scherzo as the best Divergent Universe story, but I’m ready for the arc to end and for the Doctor to come home. Next up – Threatened and desperate, the Kro’ka abandons his behind-the-scenes machinations to confront the Doctor directly. But will both of them lose their way in the maze of the strange world in which they find themselves? Paul McGann is the Doctor in…Caerdroia. This entry was posted in Big Finish Review and tagged Big Finish, Big Finish Review, C'rizz, Charley Pollard, Conrad Westmaas, Divergent Universe, Doctor Who, Doctor Who Audio, Doctor Who Review, Eighth Doctor, India Fisher, paul mcgann, TARDIS. Bookmark the permalink.